Gerald Barry was born in Ireland in 1952 and he first came to public attention at the young age of 27 with his very powerful and radical works. Since then, he has received many commissions, particularly from the BBC and today he is one of Britain's most sought after composers. Barry was also one of the main personalities at the 2000 Aldeburgh, Almeida and Huddersfield Festivals. 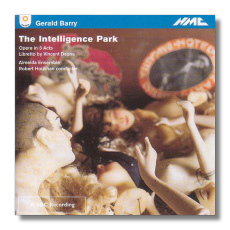 'The Intelligence Park' is his first opera. premièred in 1990 at the Almeida Festival, the work is in three Acts to a libretto by Vincent Deane. The story evolves around the year 1753 in Dublin and has as its core, the everlasting conflict between reason and feeling, obligation and inclination. Paradies (Richard Jackson) wants to write an 'opera seria' on this very subject but only because he falls in love with Serafino, a castrato (Nicholas Clapton) who is the singing teacher of Jerusha (Angela Tunstall), the girl Paradies is supposed to marry to inherit his father's estate. A series of rather strange events leave Paradies empty handed. Barry's score certainly bears no similarity to the 18th Century and musical ideas recur and develop throughout the opera. A fascinating aspect of this piece is that the scenes of the opera within are always set to different music each time. The work as a whole should be best taken as a dramatic sequence of set numbers, some of which are based on the same music. Barry also puts huge demands on the singers, as his aims are always for the performers to match the virtuosity of the instruments. This stuff is certainly not for the squeamish, but the opera has some hidden secrets which only time can unlock, and I found it so stimulating that I listened to it at a stretch. Performances, presentation and engineering are exemplary.